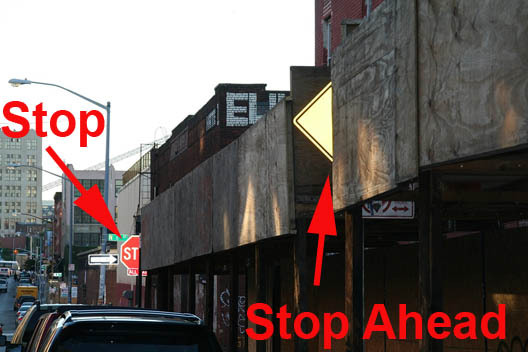 That's a "stop ahead" sign almost entirely engulfed in the shed, warning drivers about the equally-obscured stop sign at the corner. Ironically, that's a notorious intersection for both stop-sign blowers, and NYPD stings of said blowers. PD sits at that corner often in the morning, pulling over drivers who coast through the crossing....lets hope there's not a heinous accident because of this. Excellent, excellent work. Anyone up for a Music Hall of Williamsburg Pedestrian Fatality Betting Pool?